The F5 is a high tech metal detector that is very automatic making it a detector that is easy to set up and easy to use in the field. 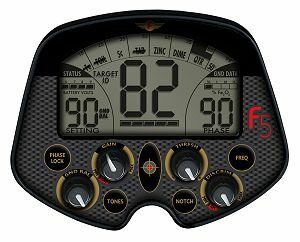 A large visual display gives you Target Identification, Target Depth while in either search mode, all metal or junk discrimination F5 operates on all types of soils with their computerized ground balancing circuit allowing you to detect in areas difficult for other metal detectors. A professional metal detector at a budget price! Fisher F5 Visual & Audio Target ID Metal Detector Combining the Best in Analog and Digital Technology. High Resolution Manual Ground Balance.